I am so excited for Hawaii and think it will be a great change of pace. I love to travel and try new things. After learning to surf in Cape Town last spring, I was hooked. The only thing I am dreading about my switch from mountains to beach is the change in clothing! I am so used to wearing baggy snow clothes everywhere; now I have to get used to doing everything in a bikini! Knowing that, I am trying to clean up my appetite a little. Around the holidays? What am I thinking?! Either way, I have been trying to find some healthier snacks and recipes to help me get bikini-ready. Kale chips are an awesome snack. They give you the salt and crunch of regular chips, but are actually healthy! 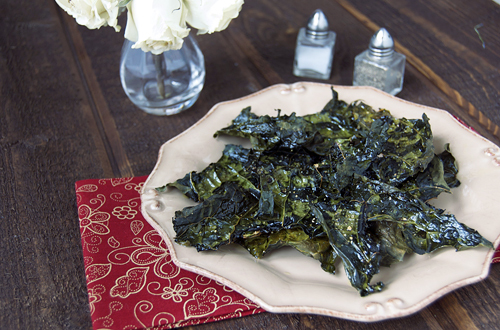 Kale chips transform a veggie that most kids would never touch into a delicious (and healthy!) snack. Preheat oven to 375F and line two cookie trays with foil. 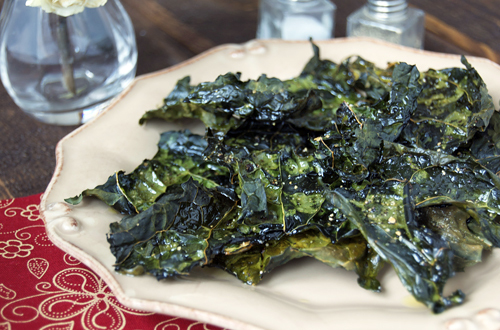 Lay kale pieces out over the trays and drizzle with olive oil. Bake at 375F until CRISP (about 10 minutes). NOTE: Be careful not to overcook or they will taste burnt. Season to taste with salt, pepper and garlic before serving. I love kale chips but I depend on them being made by a friend who uses her dehydrator to dry them out, with your recipe I might just be able to try them for myself!! Good luck on the move and will this mean some Hawaiian inspired blog posts? I hope so..
Kale chips are certainly the way to go for a healthy diet. Wish I could get my hands on some kale and try out this delicious snack. I moved from a cold climate to a beach city and never looked back 🙂 I love your kale chips. I’ve wanted to try them forever, but I’ve never seen kale here. I love kale and kale chips are one of my favorites. Your recipe is easy to follow. Thanks for sharing! Good luck with your move! I moved from Seattle to Arkansas, but I think I prefer cold Seattle weather…. Oh I love kale chips…and moving to the beach? If it wasn’t the holiday season I might tell you I hate you, especially for moving to Hawaii…what a wonderful location. I do hope that the move goes well and that you enjoy it. I can only imagine the spectacular images you will have to share with us as your photography is just fantastic. I absolutely love kale chips and so do my kids! They hardly ever make it to a plate, we usually eat right off baking sheet, lol. Good luck to you in your future adventure! how exciting!! mmm…… a friend of my switched me on to kale chips just the other day! I haven’t tried them yet though. I’ve just recently fallen for kale so I’m on it. Easy and simple way to prepare/cook kale chips. But what about the nutrients? DO making chips preserve most nutrients? As with any type of cooking, nutrients are lost the more you cook the chips, but they are still packed with healthy nutrients and are much better for you than potato chips, especially since they are not fried! I’m jealous of you moving to the beach! Boston is cold and terrible!